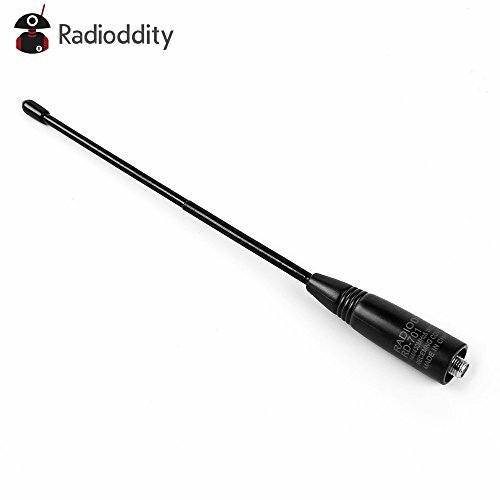 Radioddity RD-701 Antenna is almost 8 inches long and is a must for outdoor and camping usage. This is a soft flexible antenna able to withstand more 'roughness' than a stock radio antenna, all while boosting the signal of your radio significantly! And any other radio that uses the SMA-FEMALE Connection. Radioddity RD-701 Antenna is upgraded on the basis of Nagoya NA-701. Much more stable and clear. Radioddity RD-701 is a dual band high gain antenna. Frequency: 144/430MHz; Gain: 2.15dBi; Max power: 10 Watts. Compatible with most BaoFeng, Wouxun, TYT and Kenwood Handhelds. For example: UV-5R/5RTP (All models), UV6R, GT-1, GT-5/5TP, BF-9700, BF-F9+TP, BF-888S, UV-82.